Spain should instead offer a compromise. 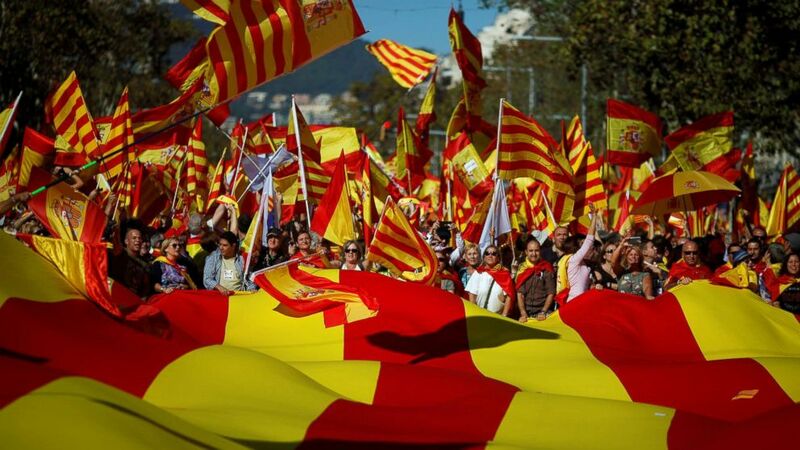 A massive, joyous demonstration of Spanish patriotism filled the streets of Barcelona. It was a glorious sight. More than a million people -- 1.3 million according to police estimates -- took part. Countless flags and banners waved above the crowd in the brilliant sunshine, transforming the broad avenues of the city into rivers of riotous color. (Rafael Marchante/Reuters) Pro-unity supporters take part in a demonstration in central Barcelona, Spain, Oct. 29, 2017. So they showed their strength. And they have the full backing of the Spanish government. But, there are two rival governments here now, each claiming to be the legitimate authority. There’s the local government, which declared independence on Friday and insists it is now the representative of a sovereign state, Catalonia. And there is the national government of Spain in Madrid, which dissolved that local government, fired its officials, threatened to arrest its leaders, and called for new elections on December 21st. As of now, both sides have forsworn the use of force. (Jon Nazca/Reuters) Pro-unity supporters take part in a demonstration in central Barcelona, Spain, Oct. 29, 2017. Spain’s strategy is to slowly assert control over the region, encourage those here who wish to remain in Spain, who may represent a majority, and watch while the international community refuses to recognize Catalonia’s declaration of independence, and the business community freaks out. Already, tourism to Catalonia is sagging. And thousands of businesses have moved their headquarters out of Barcelona, fleeing the new instability and uncertainty in what has been one of the most prosperous communities in all of Europe. People here know they risk killing the goose that’s laid so many golden eggs. But the endgame could still get violent. Feelings are running very high, and the honor of the independence movement is now at stake. 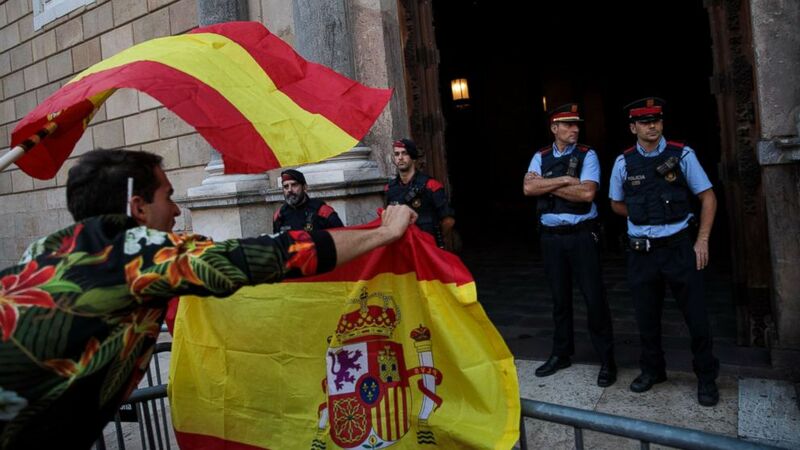 What’s needed is some sign that the government of Spain will do more than just smash this romantic movement which seeks to build a new nation, and instead offer a compromise that might address some of the grievances that fueled that dream in the first place. (Jack Taylor/Getty Images) Nationalist supporters gesture at police outside the Catalan Government building, the Palau de la Generalitat following a pro-unity protest on Oct. 29, 2017 in Barcelona, Spain. But so far, Spain has only offered unconditional surrender. As the crisis deepens, the rest of Europe waits and watches, worried. 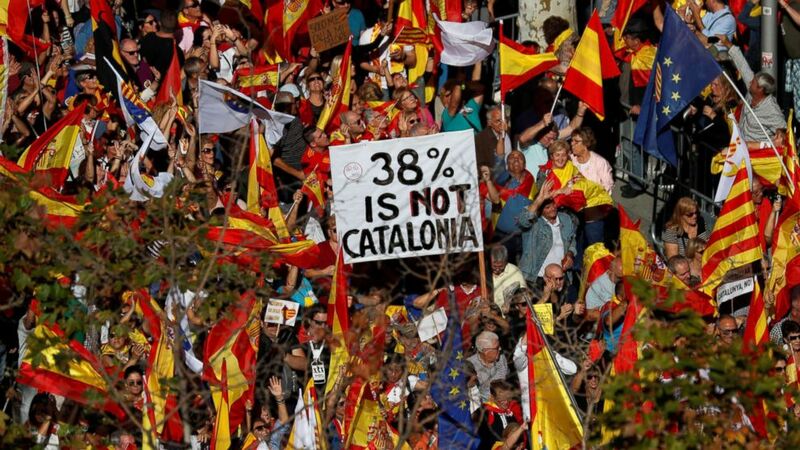 European Council President Donald Tusk spoke for many when he said that the Spanish government should use “the force of argument, not the argument of force” to bring prodigal Catalonia back into the fold.